Last week the Chancellor of the Exchequer George Osborne announced that the way in which homeowners pay stamp duty would change as of midnight on Wednesday 3rd December 2014. Previously, the amount a person had to pay in stamp duty depended on the overall price of a property; for example, if a property cost between £125,00 and £250,000 the buyer would pay 1% in stamp duty, while if it was £250,001 the buyer would have to pay 3% on the entire sum. 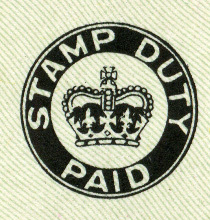 Now, the amount buyers have to pay in stamp duty is graduated, much like income tax. From now on homeowners will pay 0% tax on properties worth up to £125,000, 1% tax on properties between £125,000 and £250,000 and 3% tax on properties worth over this amount up to £925,000. Naturally, this decision by the Chancellor is extremely popular with both homeowners and landlords as it means that going forward they will save thousands of pounds each time they invest in a new property. In fact, figures published by the Council of Mortgage Lenders (CML) have shown that the new stamp duty payment scheme will save buy to let investors around £50million each year. Discussing the reforms, a spokesperson for the National Landlords Association said: “This is welcome news and is something the NLA have been lobbying hard on for years. The introduction of a straightforward marginal system of taxation will mean private landlords will now not only face lower costs when acquiring property, but also have funds to implement property improvements and keep rents down.” Meanwhile, Ajay Jagota from the sales and lettings agent KIS said: “With North East properties typically much closer to the £125,000 threshold than in other parts of the country, our region is likely to be one where buyers benefit the most. “For the buy-to-let investor this could mean both a bigger and faster return on their investment and extra capital to invest in improving the condition of their property.” It is hoped that the fact that purchasing properties is now cheaper landlords will not be forced to increase their rent prices in-line with rapidly rising property prices. Lower stamp duty payments are therefore offsetting the amount that landlords have to pay to purchase a new property as well as landlord insurance and letting agent fees. However, even though the stamp duty reforms will be beneficial to those that are looking to purchase low to middle range properties they will have an adverse effect on those wanting to buy properties over £925,000. Under the new scheme buyers will have to pay 10% stamp duty on £925,000 to £1.5million and a whopping 12% on properties worth over £1.5million. Jamie Lester, head of Haus Properties, said that those buying properties in London will miss out the most, and added: “This market has been especially active with buyers sticking below the 7% stamp duty and proposed mansion tax thresholds. These buyers will now have to pay a significantly higher amount. “For example, someone purchasing a £1.9 million property would have paid £95,000 under the old stamp duty rules, whereas under the reforms they will be paying almost £50,000 more at £141,750. However, those buying just above £2 million won’t be quite so heavily hit, for example, someone purchasing at £2.1 million will now be paying £165,750, an increase of £18,750.” Meanwhile, Camilla Dell, managing partner of Black Brick, said: “For 98% of the UK population these changes are therefore clearly good news. ← Are Tenants becoming more Financially Secure?